This is the third of several articles based on discussion at the 1/22/19 Atlantic Yards/Pacific Park Quality of Life meeting. 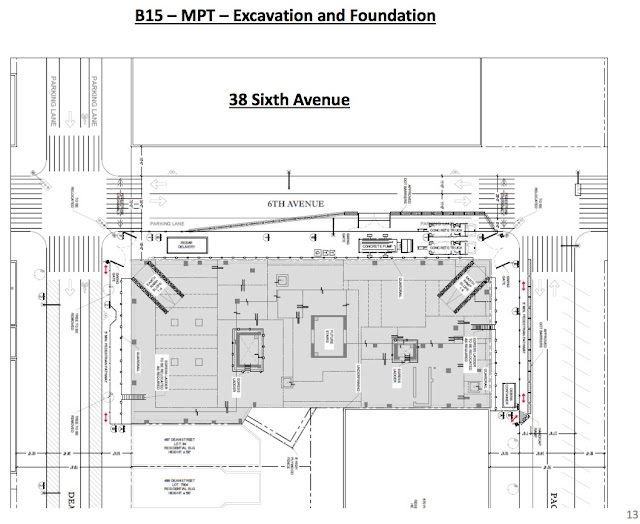 The first concerned timing for the B15 tower, with school, and the B4 tower. The second concerned questions about the affordability of future income-restricted housing. 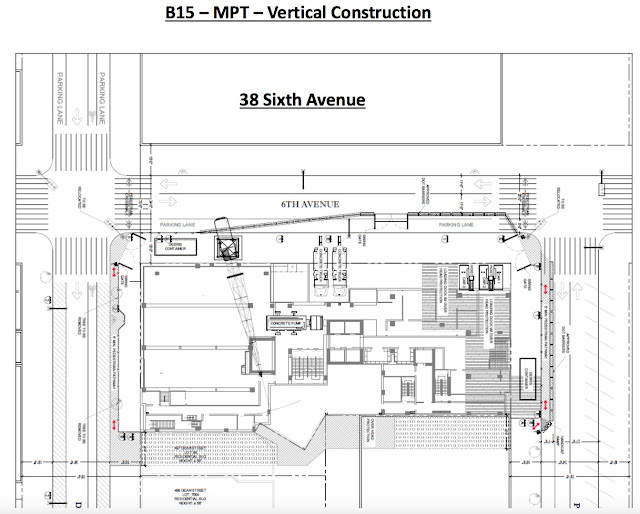 During the 34-month buildout of the B15 tower (previously called 664 Pacific), it looks like the streets around the site, bounded by Sixth Avenue, Pacific Street, and Dean Street across from the arena block, will be rather tight. 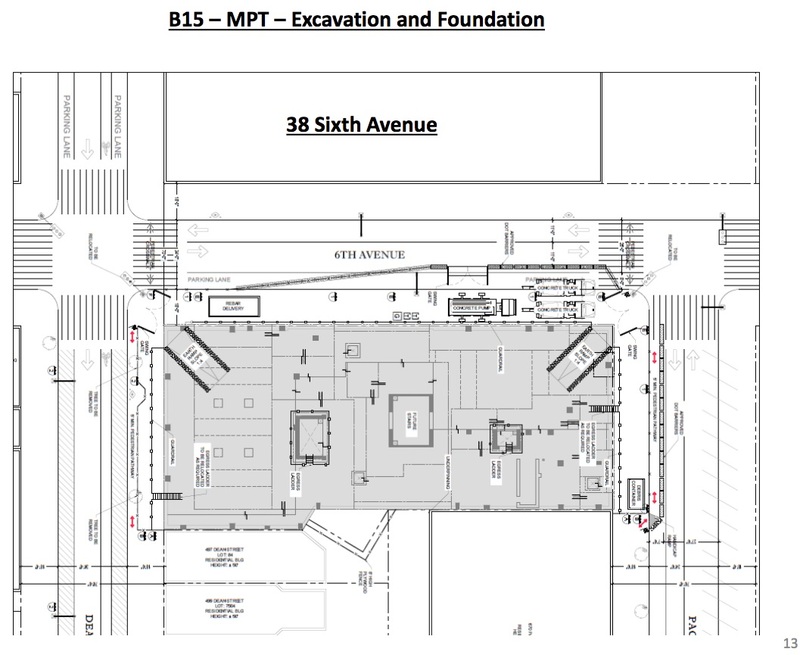 Sixth Avenue will be narrowed to two 11-foot lanes (one northbound, one southbound) between 38 Sixth, which flanks the arena, and the B15 site, according to the developer's presentation, excerpted below. That could make for tight quarters, especially when buses or other large vehicles are entering, lingering, or doing drop-offs. Sixth Avenue appears closed to pedestrians on the east side, which borders the site. While the sidewalks on Dean and Pacific streets flanking the site will be closed, narrow pedestrian passages, at least 5 feet wide, will be created. Also, keep in mind that, not far beyond the upper right corner of the images below, the unmarked space extending above the extension of Pacific Street leads to the B4 site, slated to be a huge tower under construction at roughly the same time. Presumably construction staging will significant use Atlantic Avenue.